You can set up an online store on your Wild Apricot site to sell merchandise or services. Only full account administrators can set up and manage an online store. What can you do with the store? What can't you do with the store? Add products to your product catalog. Choose your store settings and delivery options. Create a page and add a catalog gadget. 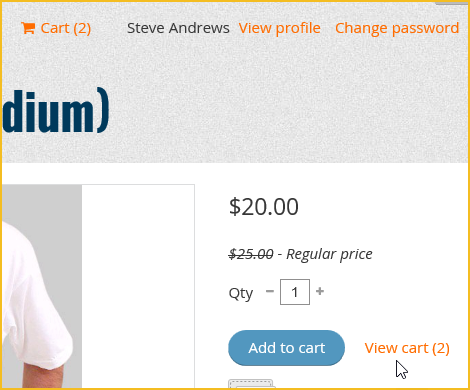 Add a cart gadget to your page template(s). 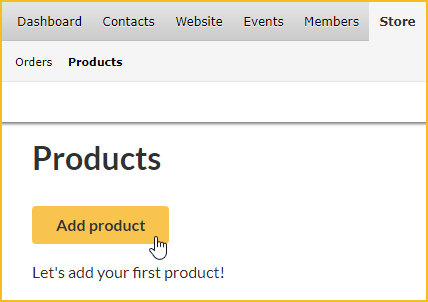 To add a product to your product catalog, hover over the Store menu and select the Products option. On the screen that appears, click the Add product button. add product variants (e.g. sizes, colors). When you are finished adjusting your product settings, scroll down and click the Save button. The following settings are available when adding a product. Controls whether the product appears in the public product catalog. Set this to Admin only until you are ready to make this product public. The name of the product to be displayed below the cover image on the public product catalog. The price for visitors to your site who are not logged as members. The price for logged in members who have a membership status of Active, Pending Renewal, or Pending Level Change (not Pending New, Lapsed, or Suspended). Used to organize products into categories. You can filter your product catalog by tags to display only certain kinds of products. You can add up to 6 images for your product. The images must be in PNG, JPG, or GIF format, and up to 2 Mb in size. The image in the first slot will be used as the cover photo in your product catalog. 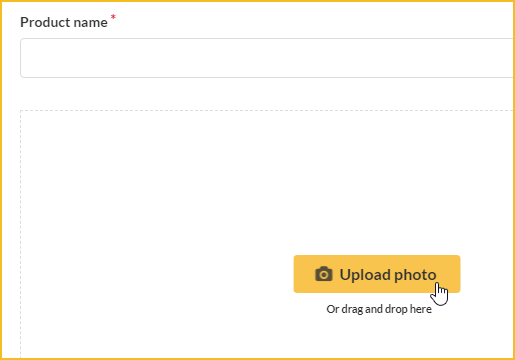 To add your first image, click the Upload photo button within the image area, or drag and drop an image onto the image area. To add more images, click one of the empty image slots then click the Upload photo button or drag and drop an image. 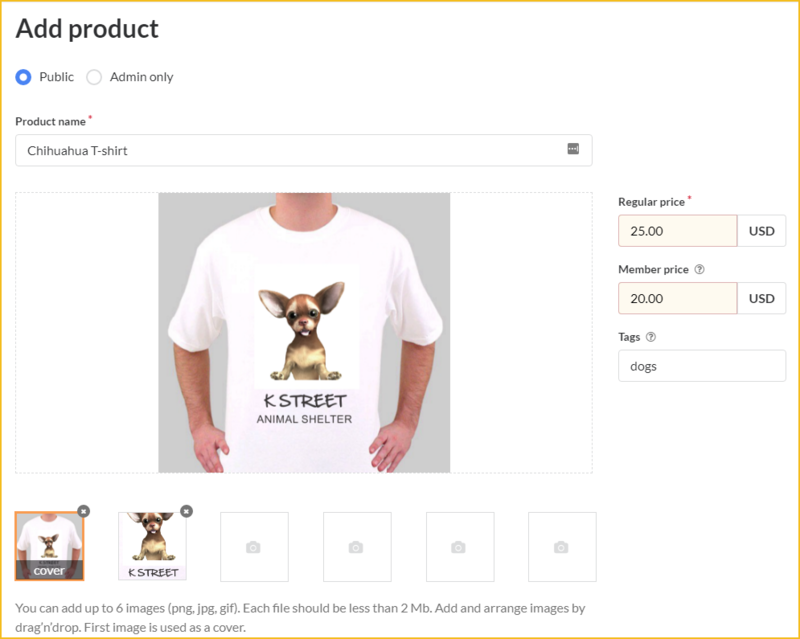 To rearrange the order of your product images, drag and drop an image from one slot to another. You can enter a description that appears on the product details page within your product catalog. Here, you choose whether you want to specify a stock quantity, so you can track inventory and cut off sales after the available stock has been sold. To specify stock quantity and track inventory, select the Track inventory option. 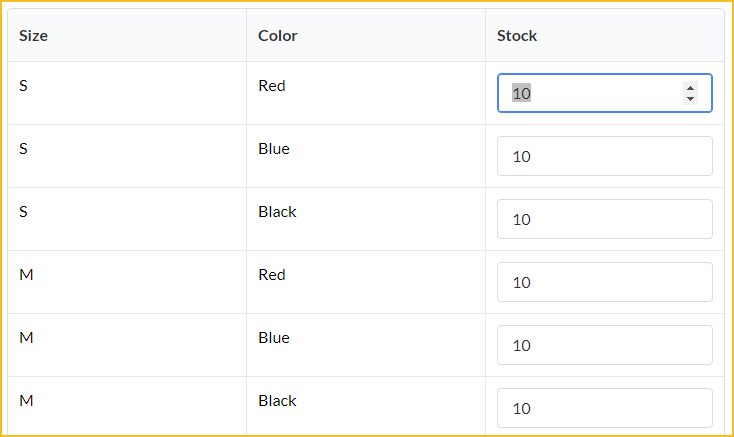 If you have no product variants (like size or color), you can enter the stock quantity for the product in the Stock field. If you have product variants set up, you specify the stock quantity for each individual variant in the Variants section (below). Your products list will display the stock quantity you have specified, or Unlimited if you haven't specified a stock quantity. As customers purchase your products, the stock quantity will be automatically adjusted to indicate the remaining quantity. 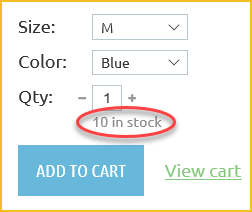 On your store, the available quantity left in stock is displayed on the product page. If there are product options, the quantity is displayed after the customer chooses their options. At checkout time, the customer will be prompted to update their cart if the quantity they requested is no longer available. You can add up to 3 product options – like different sizes or colors – to create multiple product variants (like Small, Red or Medium, Blue). To add a product option, click the Add option button under Variants. In the Option name field that appears, you identify the option (e.g. 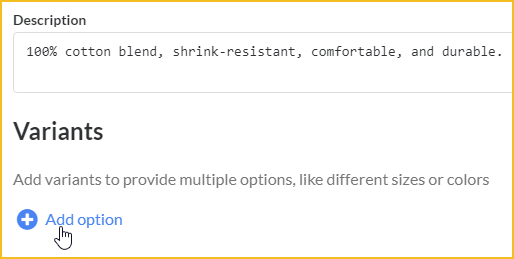 Size), and in the Option values field, you enter the values for the option, separated by a comma (e.g. S,M,L). You can specify up to 10 option values. 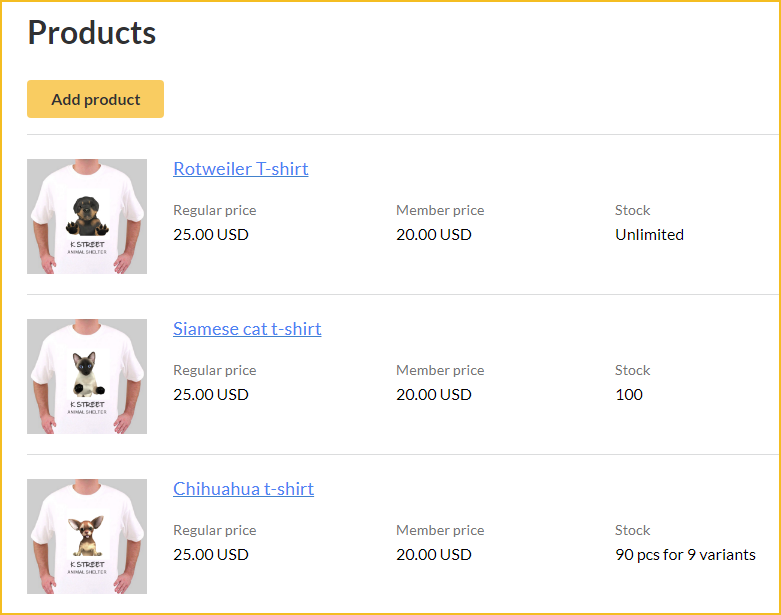 For each option, a dropdown will appear to your customers on the product details screen using the option name as its label and the option values as its contents. 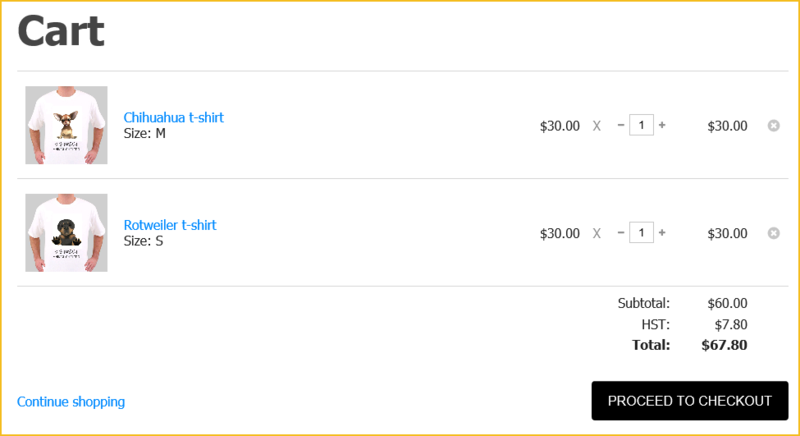 Each variant your customers choose will appear as a separate item in their shopping cart and in your product order. If you've set the product's Inventory policy to Track inventory, you can specify the stock quantity for each variant. You can remove a product from your product catalog without affecting any existing orders (or related invoices) for that product. Click the product within the products list. Scroll down and click the Delete button. When prompted to confirm your intention to delete the product, click Yes. To set up your delivery options, hover over the Store menu and select the Delivery. 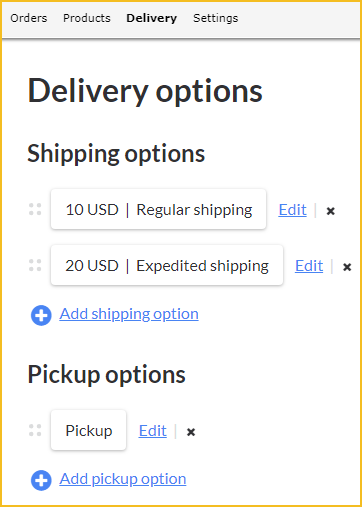 On the Delivery options screen, you can set up multiple shipping options and pickup options. For each shipping option, you can specify a shipping charge. Pickup options are always free. To create a new shipping charge, click Add shipping option. On the screen that appears, you can specify an option title, a price, and a description. For free shipping, enter a price of zero. As part of your tax settings, you can choose whether to apply your default tax rules to shipping charges. You cannot provide for different tax rates to be applied for store orders or shipping charges based on the customer's location. To add a pickup option, click Add pickup option. On the screen that appears, you can specify an option title and description. You can change the order of your shipping and pickup options by dragging and dropping them within the Delivery options screen. 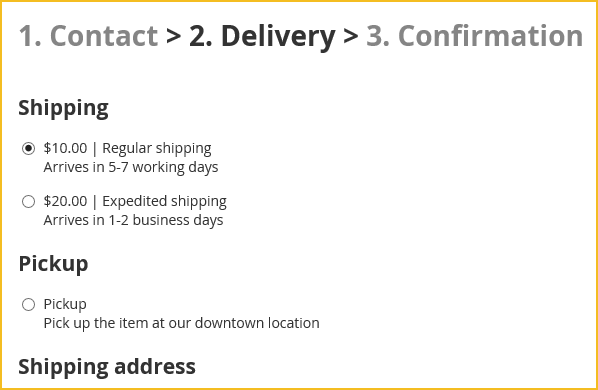 The shipping and pickup options you specify will appear on the Delivery step within the cart checkout process. Customers can choose either a shipping option or a pickup option. The first option in the list will be selected by default. If your customer chooses a shipping option, they will be required to complete the address fields before proceeding. The delivery option they choose will appear as a separate line item on their order details and their invoice. If you don't set up any delivery options, the Delivery screen will not be displayed as part of the checkout process. On the Store settings screen, you can customize the emails sent to customers and administrators, and choose whether to accept online payments, offline payments, or both. 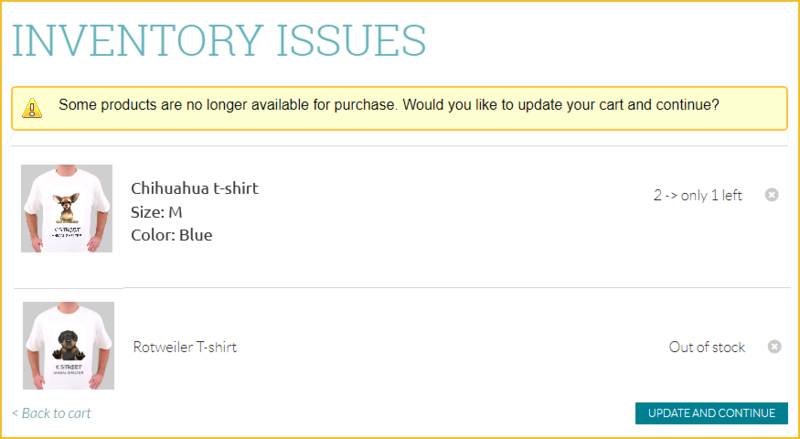 You can customize each of the emails that are automatically sent when the status of an order changes. To customize a store email, click the blue link for the message you want to customize. Sent to the customer and organization contact once the customer finishing checking out. Sent to the customer and organization contact when the status of the order is set to fulfilled. Sent to the customer and organization contact when the order is canceled. Sent to the organization contact once the customer completes checkout. You can also provide for these messages to be forwarded to other recipients using email routing. Shipping to FULL_ADDRESS. 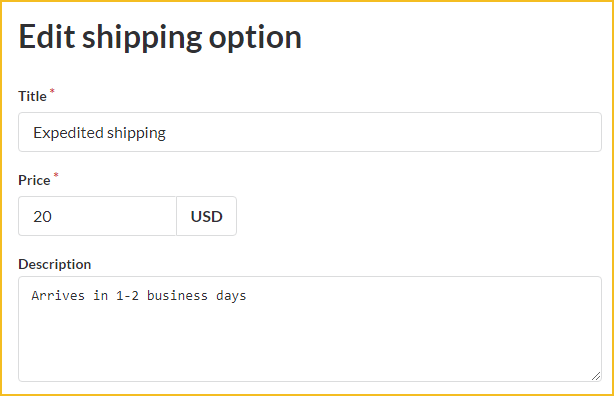 SHIPPING_OPTION_TITLE, SHIPPING_OPTION_DESCRIPTION. The instructions added to the order by the customer. A table displaying the product, price, quantity, and total cost for each item. You can choose whether to accept online and/or offline payments for store orders. The online option is only available if online payments have been enabled for your site. If only offline payment is enabled, then an invoice will be emailed to the customer after they click the Invoice me button – unless invoice emails have been disabled from the Invoice and receipt settings – and the invoice details will be displayed. From the invoice details, the customer can choose to pay the outstanding invoice online. If only online payment is enabled, then a Pay online button will appear. Clicking the Pay online button will take the customer to the online payment screen for your site's payment provider, where they can pay the store invoice. Other outstanding invoices will not be taken into consideration. If both online and offline payment is enabled, then two buttons will be displayed: Pay online and Invoice me. Clicking the Pay online button will take the customer to the online payment screen for your payment provider. Clicking the Invoice me button will result in the customer being emailed an invoice – which they can pay online or offline – and the invoice details being displayed. From the invoice details, the customer can choose to pay the outstanding invoice online. In the initial implementation of taxation support for Wild Apricot's online store, you can only choose whether to apply the default tax settings to online store purchases. You cannot override the default tax settings based on the purchaser's location. You can choose whether to enable taxes for store shipping costs, as well as product costs. Hover over the Finances menu and select the Taxes option. Choose up your default tax settings using these instructions. Within the Tax scope section, check the Online store option, and optionally, the Online store shipping option. Save the changes to your tax settings. For more information on setting up taxes in Wild Apricot, click here. So that visitors to your site can view and purchase your products, you need to add a catalog gadget to a page on your Wild Apricot site. Begin editing the site page where you want the product catalog to appear. Drag the catalog gadget from the Gadgets list, and drop it on the desired location within the page. Hover over the catalog gadget and click the Settings icon. Within the gadget settings on the left, choose the order in which you want products to appear in your catalog. You can sort the product list by date added, price, or name, in ascending or descending order. Choose whether you want to show all products on your product catalog, or just those products with a particular product tag. Click the Save button to save the changes to your page. You might want to add a content gadget with welcoming text above your catalog gadget. So that visitors to your site can jump to their shopping cart from any page, you need to add a cart gadget to one or more page templates. Hover over the Website menu and select the Templates option. Within the list of templates on the left, click the template you want to modify. Click the green Edit button at the top of the screen. Visitors to your catalog page will see the name, pricing, and cover image for your products. To view product details and place an order, they can click the image or the product title below it. Currently, administrators cannot place an order on behalf of a contact. On the product details screen, visitors can view other product images, read your product description, choose product options (like size or color), view the remaining stock quantity, adjust the order quantity, and add this order to their shopping cart. You can add content (like instructions) above or below the product details by modifying the Online store product system page. To add the order to their shopping cart, the visitor clicks the Add to cart button. With the order added to their cart, the visitor can view their shopping cart by clicking the View cart link beside the Add to cart button, or by clicking the Cart option where you placed the cart gadget. From their shopping cart, visitors can adjust the quantity of their items and proceed to checkout. 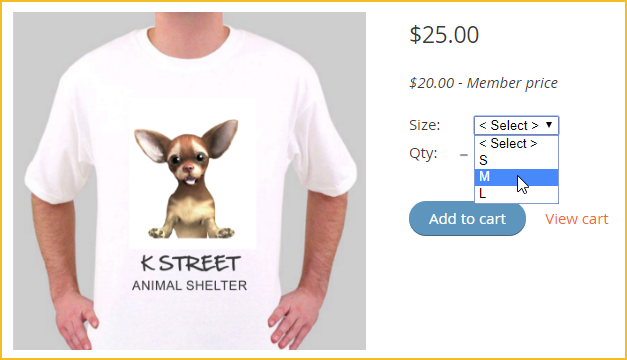 You can add content (like instructions) above or below the cart by modifying the Online store cart system page. On the first checkout screen, customers enter their contact information. Any required rules and terms fields that you have added to your common fields will appear at the bottom of the form. 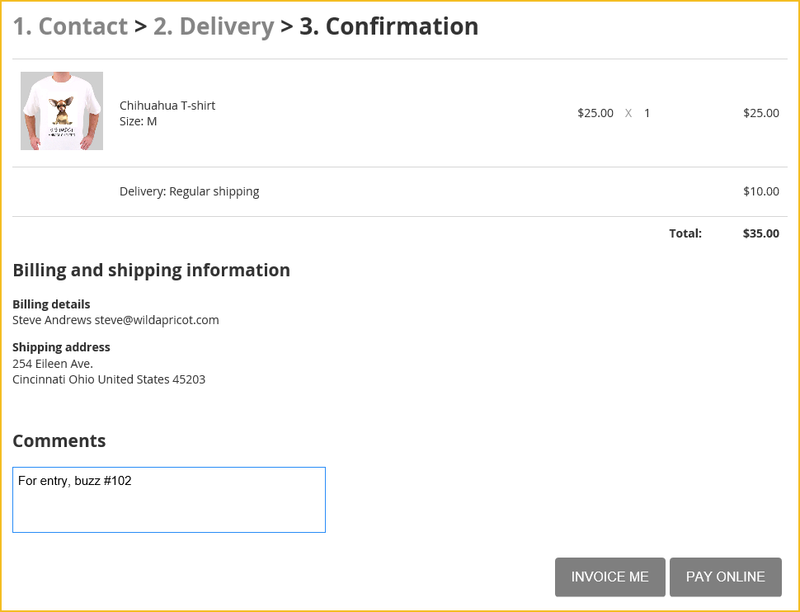 You can add content (like instructions) above or below the checkout forms by modifying the Online store checkout system page. You cannot currently choose which fields appear on these forms. If any delivery options have been set up, the next screen allows customers to enter their delivery information and choose a delivery option. 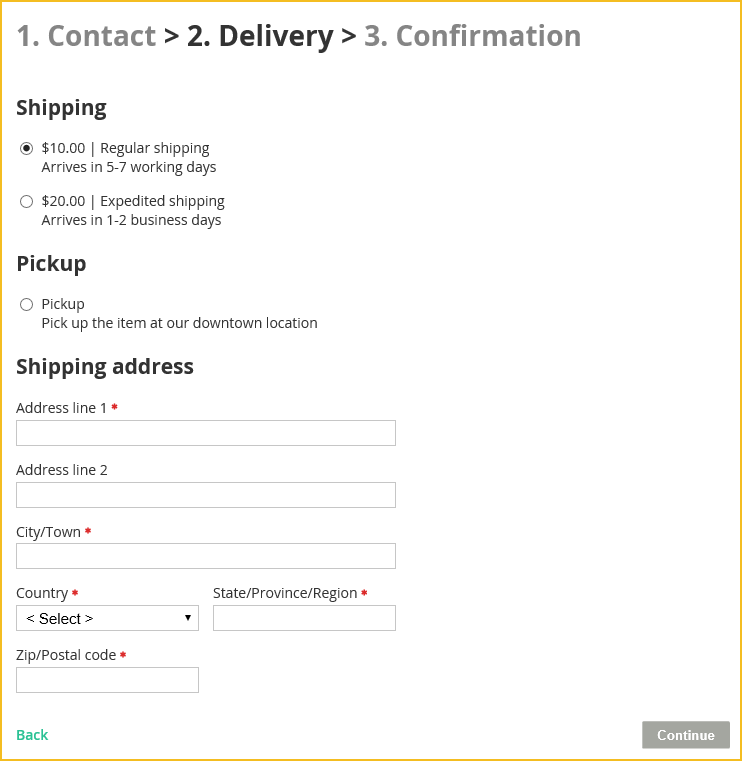 The shipping address fields are displayed only if the customer chooses one of the shipping options. 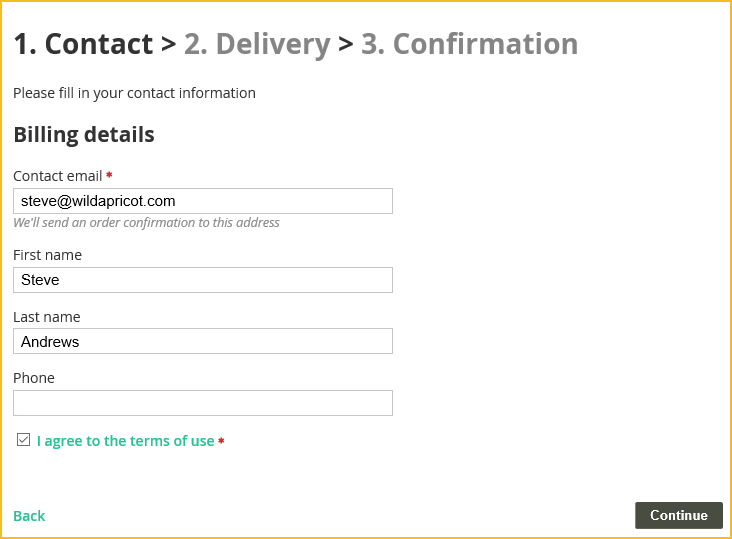 With a shipping option selected, your customer will be required to complete the address fields before proceeding. On the final checkout screen, customers confirm the billing and shipping details, and complete the order by choosing a payment option – Invoice me or Pay online. Once the customer completes the order, an email confirmation is sent to the customer and a copy is sent to your organization contact. You can customize this message, and provide for it to be copied to other recipients using email routing. 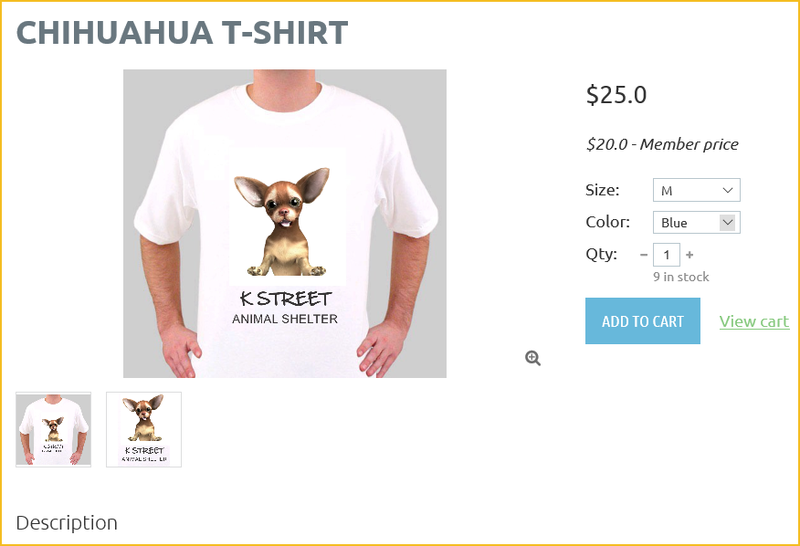 To view a list of the orders from your online store, hover over the Store menu and select the Orders option. By default, the list is sorted in chronological order. To change the sorting order, click the up or down triangles beside the appropriate column heading. To view the details of an order, click it within the list. 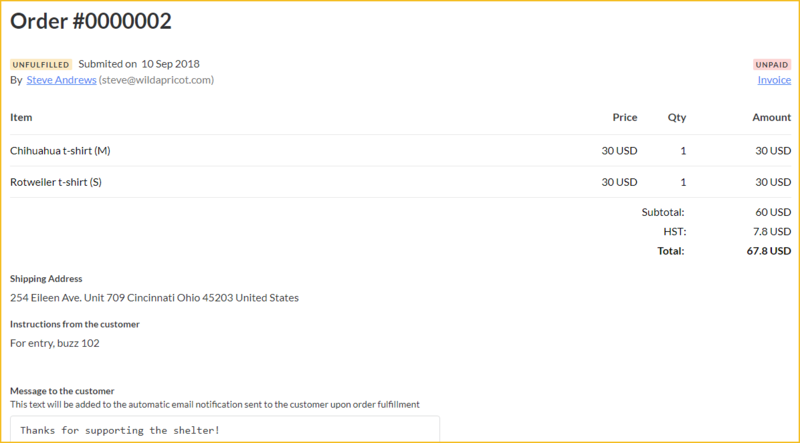 Within the order details, you can enter the text of the message to be displayed to the customer when you fulfill the order, and record internal notes that only appear within the order details in admin view. For digital orders, you can insert the URL for the digital download in the Message to the customer field. You can't format the URL as a link here but most email clients will convert a full URL to a clickable link. 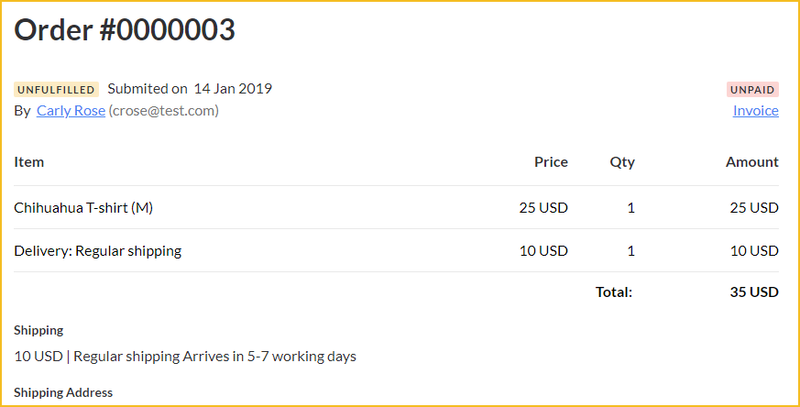 You can click the Invoice link to display the corresponding invoice for the order and record payment, or click the customer's name to jump to the contact details for that customer. Invoices and payments for online store orders will have an origin of Online store order. You can filter the invoices and payments list to display only store-related entries by choosing the Online store order filter. For orders, there are three statuses: Unfulfilled, Fulfilled, and Cancelled. A status of Fulfilled means that the order has been delivered to the customer. 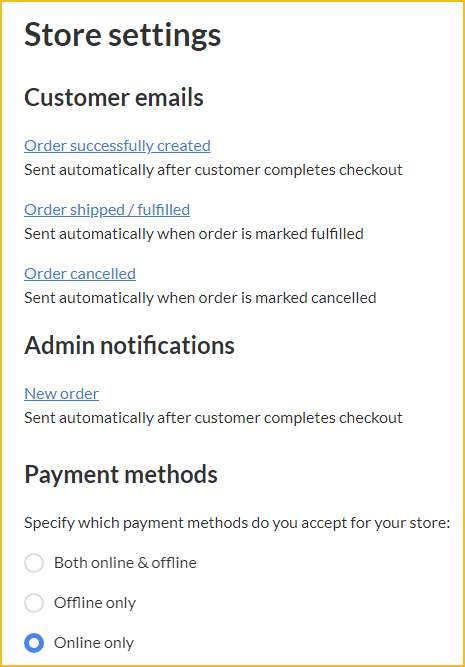 To change the status of an order from Unfulfilled to Fulfilled, display the order details then click the Fulfill order button. If the order is unpaid, you will be asked if you want to proceed with fulfilling an unpaid order. Once the order is fulfilled, a FULFILLED stamp will appear over the order details. The customer will receive the Order shipped/fulfilled email message, and a copy will be sent to your organization contact. You can customize this message, and provide for it to be copied to other recipients using email routing. You can cancel a fulfilled or unfulfilled order. Canceling an order will not automatically void the corresponding invoice or refund the order payment. You cannot undo the cancelling of an order. To cancel an order, display the order details then click the Cancel order button. Once the order is canceled, a CANCELLED stamp will appear over the order details. The customer will receive the Order canceled email message, and a copy will be sent to your organization contact. 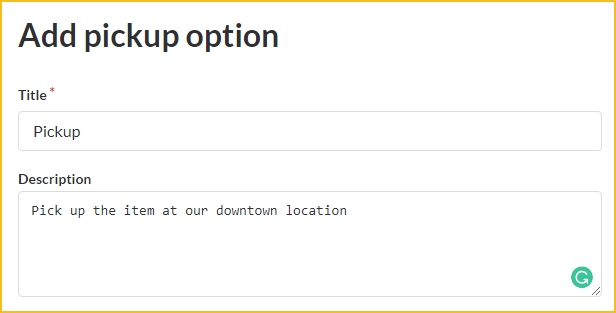 You can customize this message, and provide for it to be copied to other recipients using email routing.